Without question, 2018 has been the biggest year yet for the little blog we decided to produce once a month in the summer of 2016 here at Raich Ende Malter. The Tax Cuts and Jobs Act gave us more material to write about than we could ever hope to cover in a bimonthly column, so we went weekly. Now we’re posting twice a week—one serious original tax piece, usually on Tuesday, and a Friday tax news roundup featuring REM Randy, pictured above (hi, Randy!). It’s a significant change in format and frequency, and a far cry from the occasional thought piece in our original vision. This year, we’ve seen more new contributors, with content covering areas we haven’t touched on before. It’s all been incredibly exciting, and we’re currently hard at work on a new REM Cycle project. It should be arriving in your inboxes sometime next month. We think you’re going to like it. But enough talk. Happy holidays, happy new year, and thank you for reading. See you in 2019. We are excited to announce a change in the REM Cycle schedule. Beginning this week, our regular news roundup “Wake Up With REM” will appear on Fridays, recapping the important news events of the previous seven days. You can still look forward to fresh, relatable content every Tuesday, with everything from timely tax topics to deep dives into case studies. After a three-month marathon session, many accountants breathe a sigh of relief at midnight on October 15. Once the realization sets in that the extended filing due date has passed, now what? Time to deflate and recharge is essential! The REM Cycle polled the staff of Raich Ende Malter and compiled the top 10 things that tax accountants will be doing on Tuesday, October 16, 2018. The result? The REM Cycle’s first ever video. Please like, share, and subscribe. Tell your friends and neighbors. Data protection recap: What have we learned? It’s been a year since the Equifax data breach, impacting 147 million Americans and widely considered to be the largest consumer data breach in U.S. history. Because Equifax didn’t use strong, consistent encryption methods to protect the data they stored, hackers were able to locate and exploit a known bug in the Equifax framework to steal this information. Data breaches aren’t uncommon; several national corporations, including Home Depot and Target, have been hacked in recent years. There isn’t much we can do as individuals to control how these large companies and institutions protect our financial and personal data, but we can take steps to guard against breaches at home. Specifically, we’re going to look at phishing scams and how to avoid being tricked. Via email: A phishing email works in one of two ways: convincing you either to disclose your sensitive information or to click on a link or attachment that contains malware. SPOILER ALERT: Your bank/credit card company will never email you to verify your password or account information. Neither will Amazon, eBay, Apple, Microsoft, the IRS, or pretty much any other institution. They will not send you attachments, so don’t click on any. Via text: Gmail, Hotmail, and Yahoo never ask if you don’t want to do something with your account. If you receive a text asking you about a password reset on your account and you didn’t request to reset the password, ignore the text. Don’t even reply—that will only let the scammers know they reached a working cell phone number so they can try again. Via social media: There have been reports of Facebook users receiving messages from their contacts that consist of an .SVG image file that looks like a photo. Clicking on the file redirected the users to a fake YouTube page with prompts to add “browser extensions” in order to view the video. When users clicked the prompts, they inadvertently installed malware on their computers that allowed the scammers access to all the users’ Facebook friends. Similar scams have appeared on Instagram, Twitter, and LinkedIn. There are other social media phishing attempts out there, but this is the current big one. Via phone: If you get a call from Microsoft, the IRS, China, etc.—you’re not getting a legitimate call. Hang up and, if you can, block the number. Also: Attacks have been reported on Venmo and PayPal digital payment accounts. In the most common attack, the user (you) receives a legitimate-looking text or email that claims there’s been suspicious activity on their account and directs the user to provide updated information to avoid fraudulent charges. Another popular method does essentially the same thing but tells the user “Your payment could not be completed,” and prompts the user to provide the information. Pretty sneaky, right? Be paranoid. Never login to any website you reach by clicking a link in an email. Even if it looks authentic. Even if it doesn’t look like a link—for instance, a button in the email that says, “Verify information now.” The button is a link and clicking it will not end well for your security. Do not trust the link. No legitimate request for your username/password will come through an unsolicited email or text. If you’re not expecting an email and you know the sender: call or text them. If you don’t have their number, use a different email or messaging program to ask them if they really sent it. Do not reply to the email. If you’re not expecting it and you don’t know the sender: delete it. Better safe than sorry. Awareness is key. Scammers are shrewd, but you don’t have to be tech-savvy to outwit them. Report PayPal scams by forwarding the email to spoof@paypal.com (Venmo does not appear to have a similar feature). After a three-month marathon session of tax work, many tax accountants will be breathing a sigh of relief at midnight on April 17. Once the realization sets in that the due date has passed and they are unburdened from the intense weight of that deadline, now what? Time to deflate and recharge is essential to anyone that has just gone through such a gauntlet. The REM Cycle polled the staff of Raich Ende Malter and compiled the top 10 things that tax accountants will be doing on Wednesday, April 18, 2018. "Sit in silence and wait for the next tax season." "Celebrating my 47th wedding anniversary." Congratulations, by the way! "Keep working on April 30th deadlines. Sincerely, the financial services group." "Watch a Mets game all the way through without falling asleep." "Deal with all the file rejections -- tax season doesn't end on the deadline." "Celebrating my birthday April 18th, along with many checked items." Happy birthday! "Have the luxury of deciding what to do when I wake up that day. Not knowing is exciting and may be something wonderfully unexpected." What are your plans for tomorrow? Let us know in the comments section below. 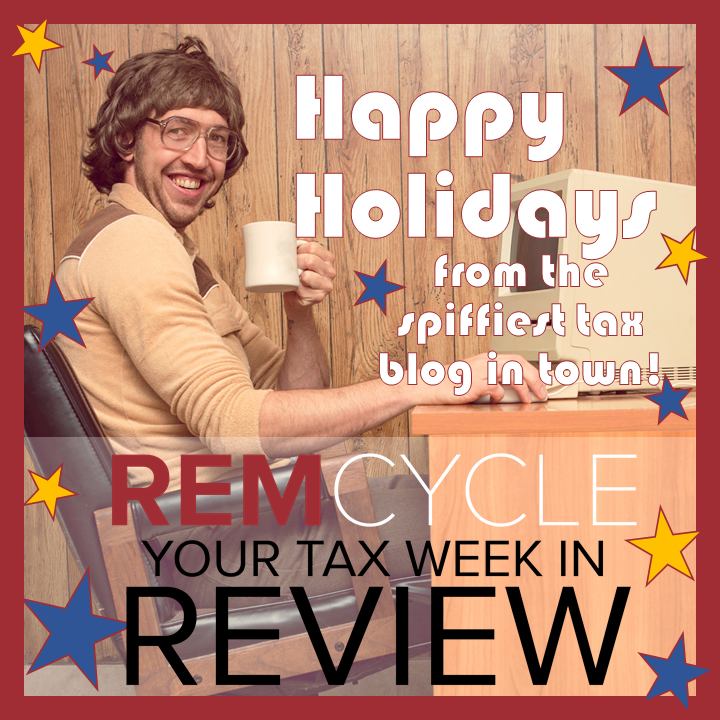 All of us here at The REM Cycle are thankful to you, our readers. Warmest wishes for a happy Thanksgiving. One year ago today, we uploaded our first post. The rest, as they say, is history. Here's the future: we have lots of new articles planned for you, as well as expert guest posts, infographics, and more. Thanks for reading. We couldn't do it without you.